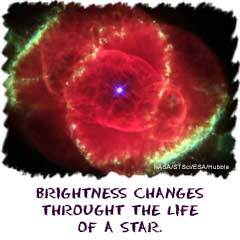 The luminosity of a star is a measure of its brightness. That's it. Simple. Astronomers measure a star's brightness by examining the amount of energy emitted (given off) every second. The more energy emitted, the higher the brightness. Scientists use Watts to measure energy. Since our Sun is so close, scientists have measured about 390,000,000,000,000,000,000,000,000 Watts being given off all of the time. We need to remind you that not all of that energy is sent to Earth. Most of it is just sent out into space as heat and other EM radiation. There are some specific factors that affect luminosity. As the size of a star increases, luminosity increases. If you think about it, a larger star has more surface area. That increased surface area allows more light and energy to be given off. Temperature also affects a star's luminosity. You don't even need to look at a star for this idea. Just think about a stove, or a fire. When you see very little light, chances are the temperature is lower. When an electric stove is off, it is black. But when it is on high, the stove glows bright red. The same idea applies to stars. As a star gets hotter, the number of nuclear reactions increases. More reactions, more energy.